New tropical drink on tap! First, though, a little bit of history behind this one. Our wonderful Lawrence Public Library is gearing up for this year's Read Across Lawrence, the eleventh edition of the community reading event sponsored by the library, KU Libraries and Friends of the Library. This year's book is "The Worst Hard Time," by Timothy Egan. The book chronicles the stories of a half dozen families during the Dust Bowl and how they survived. Lots of community events are planned for Read Across Lawrence, including book discussions, exhibits and Film Church at Liberty Hall. Read Across Lawrence Book Night kicks off the month-long event, and this is where the new tropical drink comes in. Our library does a great job planning events that appeal to a wide variety of people, and they've certainly tapped into the bar scene. On Friday, Aug. 30, during Final Fridays in downtown Lawrence, library staff will be wandering around Mass St. handing out copies of "The Worst Hard Time" and library tattoos (of the temporary kind). What's in it for you? Well, showing your library tattoo or a copy of the book will unlock secret drink specials at several Lawrence establishments, including ours! We did some quick research to find out what types of drinks were popular in the Dust Bowl era, and we found that the list included punches. So, we found a great recipe for Planter's Punch, a rum-based drink that we like to think of as a vintage version of our tropical drinks. Stop by Friday night to try our Planter's Punch, and if you show a copy of the RAL book or your library tattoo, it's only $2.50! Our new neighbor, Sandbar Sub Shop, is also participating in the book night and offering $1 fountain drinks. See the full list of drink specials here. And, stay tuned for news about the kids' version of Read Across Lawrence- we're involved in that, too! Our custom-designed pint glasses have been a huge hit since we started offering them several years ago. You can buy a pint glass anytime for $3, but they're especially popular on Tropical Thursdays, when we offer up tropical drinks for just $2.50 when they're in a pint glass. It works like this: you pay $5 for the first drink, and that gets you the tropical drink of your choice plus a glass that's yours to keep. Then, you can refill the glass anytime on Thursday with the same or a different tropical drink for $2.50. So, you're getting a small discount on the price of the glass, plus the option for discounted drinks. And, you can bring your pint glass back every Thursday if you don't want to buy a new one! Except...why wouldn't you want a new one? Our latest pint glass brainstorm is mustaches. Everyone loves the mustache drink toys, more than we could have ever imagined, and we saw cool mustache glasses on Pinterest (where else), so we decided to make our own. The first one we offered was the Handlebar, and the latest one debuts today: the Horseshoe. Better get yours while you can! Once this batch of pints sells out, we'll move on to the next mustache. We've got another new tropical drink! It's not really "tropical," it's more like "seasonal," but whatever. Thanks to our Man on the Street, Pat, for passing on the recipe for this one. It's been described as "Christmas in a glass" by Sandbar friend Ellie, who can't stop drinking them. An apple cider-like concoction with vodka and other spirits. It's perfect for the upcoming holiday season. If you haven't tried it yet, what are you waiting for? Thanks also to bartender Tegan, who gave the drink its name. And for those of you who stick around Lawrence- or come home to Lawrence- for Thanksgiving, we'll be open that night when you need a break from your family. How Popular Are Shark Attacks? The Shark Attack has been our most popular tropical drink since we first started serving them back in 2003. They've always come with a small blue or gray toy shark full of cherry juice, and either the customer or the bartender tips it into the drink to make a "shark attack." For the past year or so, our toy shark supplier has had trouble keeping the sharks in stock. We try to always keep a backup box of sharks stored upstairs, but sometimes you people just drink so many Shark Attacks, we can't keep up! Last week, the supplier was out of sharks and we were worried about getting through Homecoming weekend. So, how popular are those drinks? Dave estimates he sold a couple hundred Shark Attacks this weekend. And we ended Saturday night with exactly two sharks left in the building. Fortunately, more are on the way, so you Shark Attack addicts can keep enjoying them. We have a new tropical drink! The staff loves dreaming up new concoctions and then coming up with fun names for them. The latest tropical drink to join our lineup is the Afternoon Delight. According to Dave, it tastes like an Orange Julius. That should bring back lots of fond mall memories for you. Bartender Tegan named this drink. Like all of our tropical drinks, it comes with a toy surprise. Stop by and try it soon, and don't forget tropical drinks are on special on Thursday nights! Drink Trinkets: New Glasses are a Hit! We've had lots of drink toys over the years, but recently it's become clear that the trinkets you love the most are the ones you can wear. Moustaches, glasses, pretty much anything you can put on and take a picture of yourself in. The gummy stars are another option with the drink. We thought the stars were funny- kind of a joke on the "stars" of the reality series. The toys arrived on Friday and the bartenders started handing them out that night. They were immediately a hit. I've never seen so many pictures from the Sandbar show up on Twitter in one night, especially of drink toys. You can see more pictures on our Facebook page or our Flickr photostream. Dave loves making up new tropical concoctions. Once upon a time, the Sandbar only had one: the Bahama Mama. Then along came the Shark Attack, and for a short time we had Pat O'Brien's Hurricane mix shipped in from new Orleans, and after we saw the demand for these fruity drinks, the recipes exploded. Now, we have eight. EIGHT! That's a lot of options for such a small place. We'd like to introduce the eighth addition to our lineup: the Jersey Shore. There was a little bit of controversy in naming this drink. It's blue and glows really bright in its machine, so it was originally it was called Three Mile Island. When I was at the bar this weekend and saw it for the first time, my immediate thought was "Wow! It's electric!" You know, the wedding dance song "Electric Boogie." So that's what we were going to rename the drink. Until Blair worked Saturday night. He wanted to name it "Jersey Shore," after the inexplicably popular reality show. Of course, the trendy choice trumped mine, so you can now order up a Jersey Shore at the bar. Ironically, I've been told that the cast of Jersey Shore frequents a club in New Jersey called the Sandbar (no idea if they really go there, but there is/was a Sandbar in Jersey), and one time on Twitter someone showed me a tweet from Snooki that talked about her love of Bahama Mamas. I'm sure ours are better. We're proud to announce our first diet tropical drink, the Teeny Bikini! This drink is a mixture of fruit punch Crystal Light, Fresca and vodka. That's right girls, the only calories in this drink come from the vodka. Now you can order something besides a vodka soda and actually enjoy the flavor. Of course, it still comes with beads and toys, and it's part of our Tropical Thursday lineup where you can get it for $2.50. Stop by and try a Teeny Bikini! 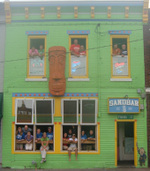 The Sandbar is known for its fruity, frothy tropical concoctions like Bahama Mamas and Pink Flamingos. Lots of boys aren't scared to order them, but we know there are some of you out there who think they're too sweet. Joe "the Factor" felt your pain. He decided it was time for the Sandbar to feature a more manly tropical drink, which might be an oxymoron, and he set out to find one. He started by doing the obvious: googling "manly tropical drinks." He found one with bourbon that sounded good called the Bourmuda Triangle. Get it? Like Bermuda Triangle, but with a reference to bourbon in the title. Clever. This particular drink called for bourbon, lemonade, pineapple and coconut juice. Joe made a few changes and mastered a mix that included triple sec and ditched the coconut juice. It's a cool refreshing drink, similar to a Lynchburg Lemonade. The Bourmuda Triangle is featured in the drink machine behind the bar now. Even though it's a "manly" drink, it still has to come with toys. We're currently searching for a drink trinket that fits the bill. Suggestions? Leave them in the comments. And of course, we still have the Bahama Mama and Shark Attack- those aren't going anywhere!